6.4.2013. Too tired to be much of a tour guide tonight. We had a relaxed start to the day, then raced along I-90 (speed limit = 75 mph) to Badlands National Park. The park was awesome -- full of views we will never be able to convey with our amateur photos. We were very happy that the park was uncrowded -- just enough people so that we didn't feel wierdly alone. The wind was icy and had us rummaging through the back seat looking for hats and coats. With all our organization, funny how chaotic the back seat becomes as we pull things in and out and toss things over our shoulders as we drive along. We dawdled at the Badlands, so that the drive to our final destination for the evening seemed suddenly very far away. We did a little more bulleting along I-90, to Rapid City, then got off for our planned scenic drive through the Black Hills to Spearfish. The scenery rapidly transformed from eerie windswept clay formations to alpine pine forest. We had planned to take our time along this route but... at four o'clock I turn into a pumpkin... so we needed to hustle. We took a shortcut through Deadwood. I originally looked at lodging there, but the place is full of casinos... If you could squint your eyes past the casino signs, the place is definitely a picturesque slice of the past. When we needed a little mood music, we turned back on the country and western channel. Seemed just right. 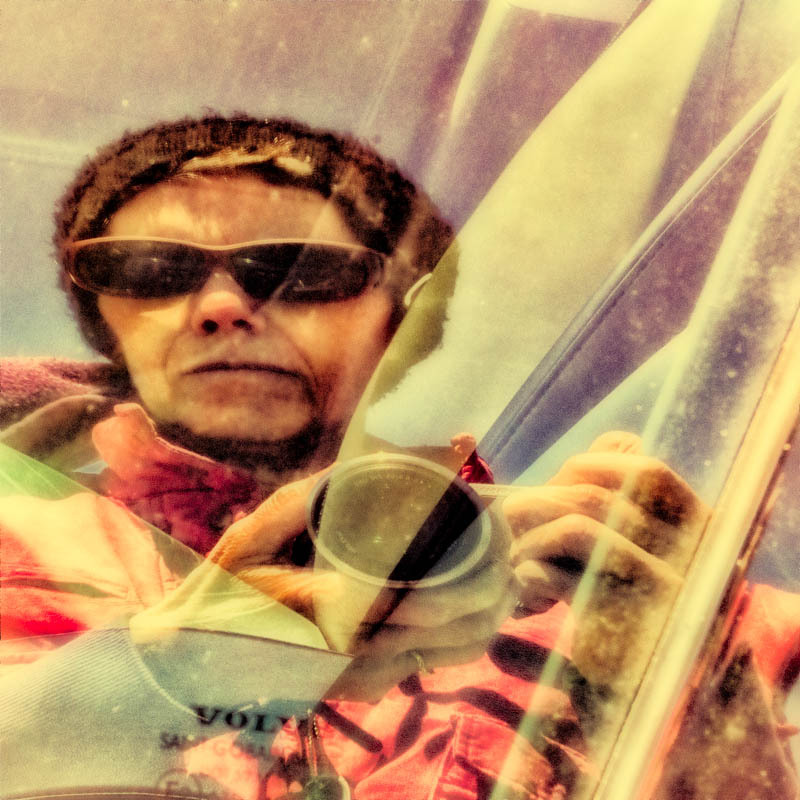 Classic self-portrait taken in the car window at Badlands NP.